The commercial litigation and real estate attorneys at KALIS, KLEIMAN & WOLFE represent landlords and tenants in a variety of residential and commercial real estate disputes. Our client list includes renters, owners, managers, builders, developers and investors, shopping complexes, hotels, condos and townhouses, apartment complexes, mixed use buildings, residential developments and more. While disputes between landlords and tenants are common, they both have rights and responsibilities under Florida Law. A tenant is entitled to the right of private, peaceful possession of the dwelling, business or property. The tenant is also to maintain the property in such condition. The tenant must pay the agreed upon rent and security deposit and do so on time. 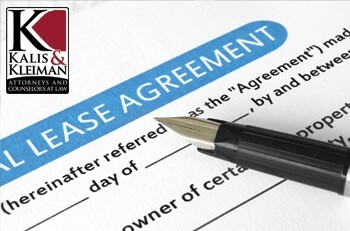 The tenant has the right to move out based on agreement or non-agreement in place. In certain situations, the tenant may withhold rent or terminate the lease. The landlord is required to rent a dwelling that is fit to be lived in or worked in. It must have working plumbing, hot water and heating, be structurally sound and have reasonable security, including working and locking doors and windows, and it must be free of pests. The landlord must also comply with local health, building, and safety codes. If the landlord has to make repairs to make the dwelling fit to live in, the landlord must pay. A landlord cannot deny housing or property rental or unfairly treat the potential tenant because of unlawful discrimination. In certain situations tenants may be evicted, locked-out and personal or business property seized. Whether looking at a new residential or commercial rental, renewing an agreement, or you are facing a landlord-tenant dispute, it is important to hire an experienced real estate and business attorney to protect your rights and investment. For more than 80 years combined our residential and commercial real estate attorneys have worked to minimize the risk and liability of landlords. We have also represented and protected the rights of tenants who have suffered personal and business losses due to the actions of their landlord. Our objective is to do what is right for our client from both a legal perspective and a business perspective; including litigation when necessary to resolve a dispute. If you are faced with a landlord-tenant dispute and need guidance, contact the experienced Real Estate Attorneys at KALIS, KLEIMAN & WOLFE, the South Florida-based commercial litigation law firm today at (954) 791-0477.